Check out the 150 Premium Autumn Professional Lightroom Presets to give your pictures a warm autumn mood! Created by and for photography and design professionals, these ready-to-use presets will save the time spent on post processing. At that, with less time spent, you’ll get great results with your initial photos! Installing ready-made Lightroom presets is extremely easy. All it takes is to import the needed presets into a Lightroom Presets folder and choose from the options that become available in the app’s menu. 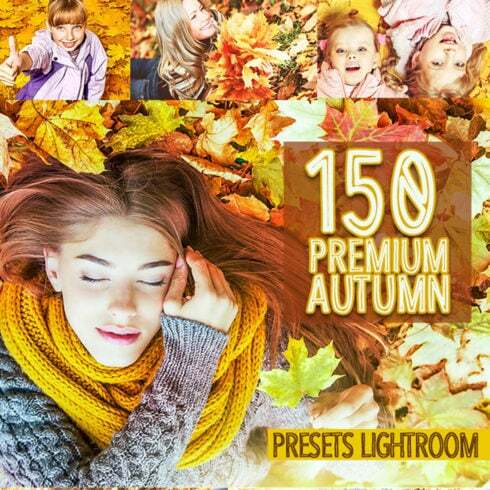 150 Premium Autumn presets for Adobe Lightroom come packed in a single collection! With their help, even a photography amateur can create and apply a vast range of effects easily. Irrespective of the software version used, these ready-made presets are fully compatible with Lightroom 5, 6, or CC (CC-CC2015), and can be used on a Mac or a Windows PC. The download package contains 150 ready-made autumn presets for Adobe Lightroom. All items work perfectly for RAW and JPEG image formats and can be adjusted to fit your image. You can use the presets straight after the purchase. Hurry up and purchase a set of magnificent 150 Premium Autumn Professional Lightroom Presets to enjoy your pictures in the new light! 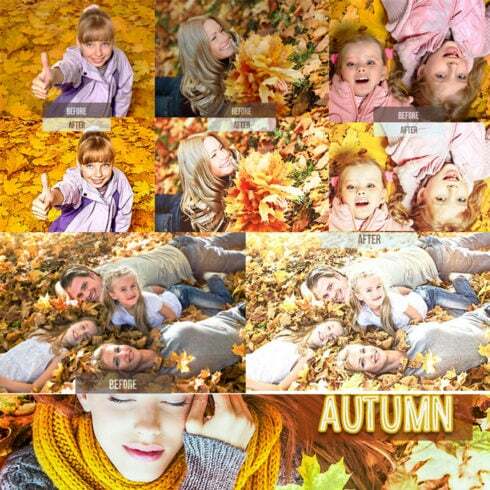 The 150 Premium Autumn Professional Lightroom Presets were designed by and for photographers and designers. We use those very same presets when editing our own images – and now you can too! If you want to reduce the amount of time you spend on post processing and get amazing results with your photos, Lightroom presets can be the answer. We offer all of our presets in one collection that will allow you to create a wide range of effects very easily. These presets can be used in Lightroom 5, 6, or CC and on a Mac or a PC. Explain what is a 150 Premium Autumn Lightroom Presets deal? If you are a graphic designer working on many tasks concurrently, you, like no other folks, see the need for the entire bunch of design items available at hand. Hunting for them separately, you spend whole lot more money and time consequently. To get every one of the desired elements in one package, we advocate taking a closer look at graphic bundle deals. A bundle is a assortment of design components meant for graphic design, valued for a large amount of money, however offered at a substantially reduced price tag for a limited time. Due to the fact each of the bundle deals are different from one to another, every designer will find the needed collection for a specific venture. Checking them you will find the collections including UI kits, social media infographics, illustration swatches, business cards, PPT templates, and much more. At MasterBundles.com marketplace, you can find over 450 graphic bundles available. What’s the point of using 150 Premium Autumn Lightroom Presets? The pros of graphic deals for web designers are pretty obvious. However if you are a newcomer to those elements and now have doubts, the subsequent info will be of great help for you. Including a great number of the components in a single pack, the selection gives you a chance to use different of them for various tasks. Besides, the price is usually cut down tremendously which lets you stretch your budget, yet receive the entire set priced at hundreds or thousands of dollars. Ways to spend a lesser amount of funds on MasterBundles.com 150 Premium Autumn Lightroom Presets? There’s a way to make the MasterBundles products even cheaper. Ok, I am aware bundles are already inexpensive, however, there is still place to save. Just share this webpage via social media – you automatically get the 5% price reduction for any of the graphic deals that appeals to you. That is a quite simple way of getting a professionally created tools cheaper. MasterBundles could offer you a big selection of unique products. We offer not just graphics packages but also something like 20 other different types of items. Fonts, WordPress themes, mockups, icons, photos, illustrations, presentation templates and a great deal more – on the MasterBundles it’s possible to locate all of the graphic items, vital for a design. A different package deal suitable for photographers is part of photo deals. Here you’ll discover numerous solutions for photo manipulation. When you need Lightroom presets, photo overlays, PS actions, or other tools for dealing with pictures, you have come to the right place. The watercolor graphics bundle can be described as a package which contains pics and illustrations painted with watercolors. They’ll properly come in handy for a wide variety of businesses, like fashion, cosmetics, perfume and food distributors. Cards or themed wedding invitations could also be created using this package deal. Precisely what is an Instagram template? You thought it is sufficient to simply post several photos to get a well-known and profitable Insta account. To bring in fans, your Instagram feed should look gorgeous and attention-grabbing. Instagram templates will let you achieve that goal and help to make your Instagram posts eye-catching and recognizable. Collected into packages they can be purchased for less money, so don’t miss it! If you need infographics for the business presentation in any kind of industries through social networking and marketing to medical care and education, the bundle is right what you have been looking for. With the infographics bundle you will find yourself saving your time which is crucial when it comes to productivity. Every single component comes in a separate file that may be edited in Illustrator, Powerpoint or Photoshop. If you feel as if you have lost track of time when researching various tools and components for your design projects, it is about time to explore MasterBundles. It is a marketplace offering the most in-demand tools (icons, graphics, watercolors, logos, presentations, fonts etc.) for designers, entrepreneurs, and developers at a reasonable price for a short period of time. To not miss important news about the future promotions, we advise reading our blog and signing up for the newsletter.